Karanda crawled off Solomon and stood up, dusting herself off. ‘Well, you can’t stay here,’ she said, crossing her arms. ‘It’s not your desert,’ Solomon said, sticking his chin out. Since her mother abandoned her, Karanda has been through a strong of foster homes, and has quickly learnt to rely only on herself. So, when a car crash on the way to her sixth foster home sees her stranded in the desert, she takes the opportunity to run. She is going to escape and start a new life of her own. What she doesn’t count on is pesky eight-year old Solomon wanting to tag along. If only he wasn’t so nice to her all the time, she could leave him behind. 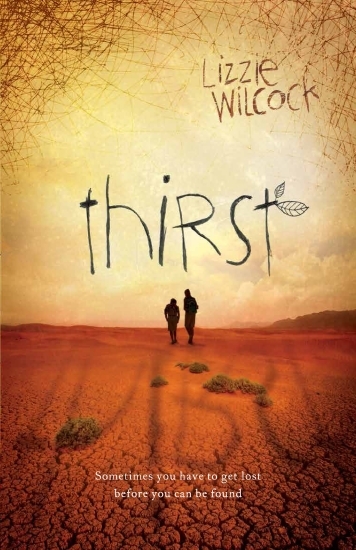 Thirst is a story of survival set in the harsh Australian desert, a setting which is echoed in the harshness of fourteen year old Karanda’s life to date. As Karanda and Solomon set out into the desert, hoping to avoid being found following the crash which has given them freedom, they must battle the elements one would expect to find in the Australian desert – heat, thirst, flood, lack of shelter, hunger and dangerous wildlife. They must also battle their own demons and, at times, each other. Young readers with an interest in survival stories and adventures will enjoy the story and the bush tucker, and as the characters develop will come to want to see them become friends and, ultimately, find happiness. His fingers arched and suddenly shards of sharp metal spat straight at her, shards made not of true metal but of Charter marks, conjured so swiftly that he must have already had most of the spell put together and hidden on his person, awaiting only a single mark to activate it. Clariel reacted instantly, ducking under her shards, but even so she felt the heat of their passage above her head. Clariel doesn’t want to be in the city of Belisaere. All her life she has lived close to the forest, and that is where she feels called to be. But her parents have other plans for her – and so, it seems, do many others. Clariel’s mother has been invited to join the High Guild of Goldsmiths, the main reason for moving to Belisaere. Clariel is a granddaughter to the Abhorsen – though they’ve never met because of an estrangement – and is also related to the King. Her parents want her to marry the Guildmaster’s son; the Guildmaster, too, wants this – because he can then overthrow the King and install her as Queen. Her few allies also find her bloodlines useful, meaning even they can not be completely trusted. All Clariel wants is to escape the city and return to the forest – but that is going to be nearly impossible. 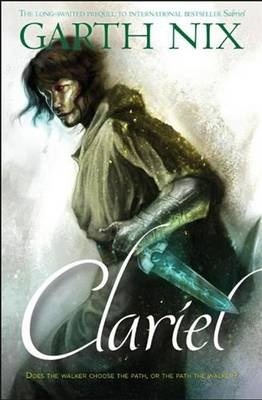 Clariel marks a much awaited return to the Old Kingdom for lovers of the series. Set 600 years before Sabriel, this prequel is set in a world which will be familiar to fans, and which will intrigue new readers. Clariel is a strong female lead, with an interesting mix of skills and problems, most notably her ability to connect to free magic and the fact that she is a berserk, prone to deep rages which give her great strength, but are difficult to harness. With extras including maps of the Old Kingdom and of Belisaere, a sample of Sabriel and an essay on Free Magic, from the Library of Clayr, fans will be satisfied after their long wait – and many new fans will be hooked. Three Guardians to find, all in different corners of Alban; three branches of knowledge to master; and then, the disparate talents of humankind and Good Folk to be brought into an alliance strong enough to stand up against the might of Keldec and his Enforcers…all that in a scant year and a half? When I had thus far failed to exchange even one word with the Folk Below? It was…I must not say impossible. I was one of Regan’s rebels now, and I must not even think it. ‘Ill try my best,’ I said. Safe in the shelter of Shadowfell, the rebel base, Neryn is rebuilding her strength and learning what her skills as Caller might be able to achieve. She knows that, if she can master her gift, she will be a powerful tool for the rebels to defeat the King and free Alban of his tyranny. But mastering her gifts will take time, and suddenly time is something she doesn’t have. If the Rebels’ plan is to work, she has only eighteen months to learn what she needs to know, and gain the support of the Good Folk. As soon as winter ends, Neryn is on the road, seeking out the three Guardians who can teach her what she needs to know. Each is in a remote corner of Alban, and travelling in a kingdom where her magical skills are perilous should they be discovered is difficult. Her companion is Tali, a fighter who will defend her with her life, but who would rather be elsewhere. As they travel, both face challenges which will test them beyond their limits. Raven Flight is the sequel to Shadowfell, and the second in the trilogy. For a reader new to the series, it doesn’t take long to get caught up in the tale, though reading the first would be an advantage, and, one suspects, rewarding. Marillier’s characters are engaging, the world captivating and the story tightly woven. Whilst, as is necessary in a trilogy, the ending leaves the reader wanting more, the end point is in itself satisfying, with enough of this instalment resolved, and equally enough hints at what is yet to come. Available from good bookstores or online . Buying through this link supports Aussiereviews. Beside their own balconette was another that belonged to the room next door. After a moment the girl with the mass of awful hair stepped out onto it. She peered at Froi, almost within touching distance. Up close she was even stranger looking and it was with an unabashed manner that she studied him now and with great curiosity. Her brow furrowed, a cleft on her chin so pronounced it was as if someone had spent their life pointing out her strangeness. Her hair was a filthy mess almost reaching her waist. It was straw-like in texture and Froi imagined that if it were washed, it might be described as a darker shade of fair. But for now, it looked dirty, its colour almost indescribable. She squinted at his appraisal. Froi squinted back. Once he was a foundling, and growing up Froi had no idea where he belonged – only that he needed to be quick and wily to survive. Now, though, he is happy living in Lumatere, serving the Queen and her consort, Finnikin. This is where he belongs. But a stranger arrives, seeking someone to go on a mission in the kingdom of Charyn. And, Froi, it seems, is the perfect candidate. Soon he finds himself at the palace of the enemy king,w here he assumes the disguise of one of the young men chosen tot ry to impregnate a princess and thus break a generation long curse. But the princess proves a surprise packet, and Froi is also drawn to others in the court, threatening to steer him away from his mission. It seems the kingdom of Charyn may hold the key to Froi’s mysterious past, as well as his future. Froi of the Exiles is an emotional roller coaster of a book. There is the joy – such as seeing Finnikin and Isaboe working together to restore Lumatere, anguish – of women separated from children, of lovers forced to live apart – and horror. Lots of it. There are mysteries of parentage, bonds and betrayals. And there is Quintana, the troubled, trapped princess who nobody likes or understands, but on whom the future of a nation rests. It isn’t an easy book, with so much emotion, but the characters, and their troubles, are so finely drawn that it is a tough ride the readers wants to take. Lengthy, at almost 600 pages, the gripping sequel to Finnikin of the Rock,stands alone, so not having read the former should not stand in the way of reading this one.